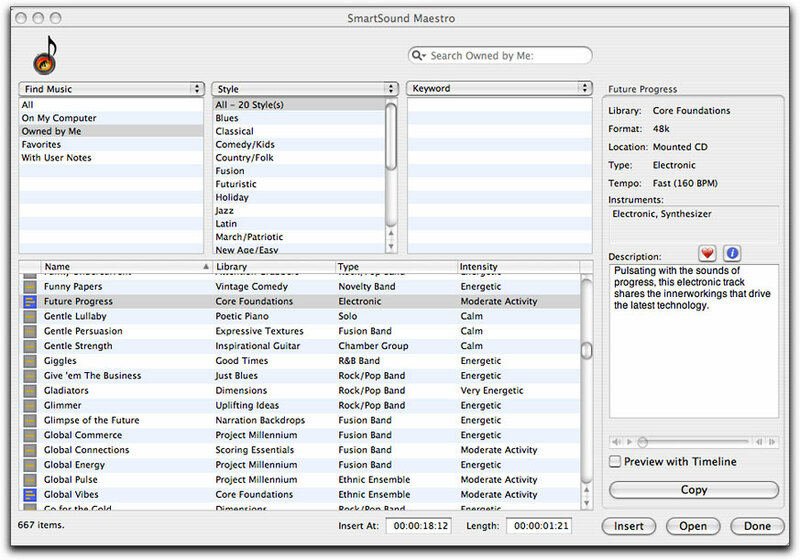 For many years now I have enjoyed working with the SmartSound software, which, over time, has grown in both the quantity of available music and evolved in its application software. With the release of SmartSound's new version, Sonicfire Pro 4, we enjoy some major new developments, which may be taken advantage of by both the hobbyist of any level as well as the professional editor. What's of major importance in any film shot and produced, what creates the mood and keeps or changes the direction of the film is the musical score. Not everyone is a professional musician and can write their own music and not every one has the musical aptitude to create their own piece in Apple's Soundtrack, Garage Band or in Acid. Many just want a suitable piece to be able to fit the genre of film they have worked so hard in creating. Copyright laws, being what they are, are nothing to be played with, especially if you intend to sell your film or broadcast it in any way. Thus, purchasing copyright free music is simply part of the expense within any production. However, buying a disc's library of music and only needing one cut now becomes a MAJOR expense. In the past, SmartSound and Sonicfire Pro 3.0 have been exceptional in their ability to give the editor what they wanted by offering an ever-growing library of music to fit most any need. What's more, you now have the ability to adjust the tonality and presentation to your own customized musical vision. Sonicfire Pro 4 keeps most of the features that were so easy to use in Sonicfire Pro 3. You can still bring in video to score your film as you watch and make changes. It is still as simple as pie to select a cut, punch in the time of the cut that you need, and let Sonicfire Pro do the work from there creating a finished piece with beautifully crafted fades both up and down at the beginning and end. For those so inclined, you can still customize each cut by adding, removing or switching around any number of the musical blocks that you desire in order to create your piece. Now, however, Sonicfire Pro 4 will allow you to take customization to the next level. 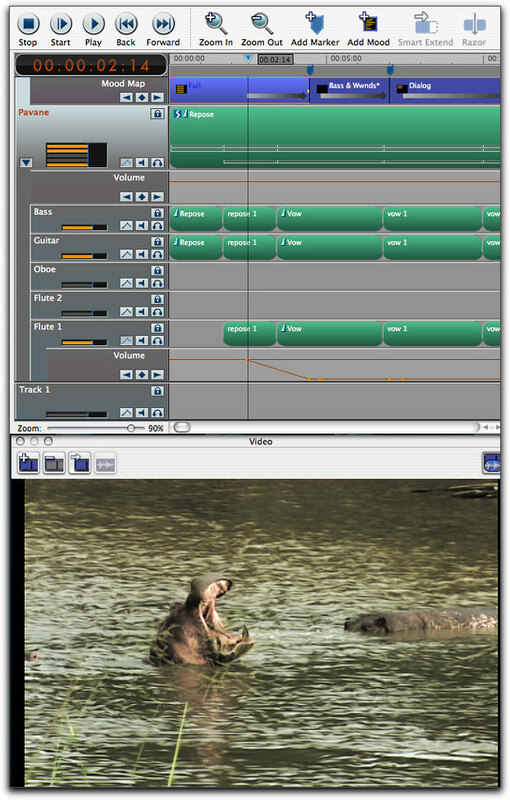 Each composition is first opened in the Files and Blocks window. You can keep them as is or change them around to suit your needs. So, what is the difference between versions 3 and 4? Actually, there are several and almost every one of them makes upgrading to Sonicfire Pro 4 well worth it. One tool, which no longer exists in Sonicfire Pro 4, is the Assistant. The Assistant guided the user through a series of questions asking if you wanted a musical selection or sound effect which would lead you to another window asking what style of music you preferred which lead you to yet another window which provided a large selection of keywords which would best describe your wishes whether it be atmospheric, calm, cool, cheerful or a host of others. I found then that their idea of calm and mine were frequently different. Then the assistant would lead you to a selection of recommended cuts and ask you to insert the disc that a particular cut came from. In actuality, I found the Assistant to be superfluous to the Sonicfire Pro Maestro, which now remains as the only and sole tool needed to preview and open up any cut. The Maestro remains an excellent way to not only preview the sound of any cut you may have in your library but also to listen to cuts that you may not have by via an internet conduit to the SmartSound website. Here you may download either an entire disc's worth of music or simply buy and download the single cut that will enhance your video presentation. The Maestro also provides an easy view of all the discs and their cuts that currently exist in your music library, which you can see organized by either the name of the cut, its library disc, its' musical genre or by the individual intensity of the piece. If you have already brought in a video piece from Final Cut Pro or other NLE, all you need to do is to check the 'Preview with Timeline' window and viola, you get to see just how the music might fit the video clip you are working with. The maestro also lets you know just how many beats per minute each music cut is so that video markers can be placed for further customizing. Editing to the beat just got easier. The Maestro is where it all begins. This is the tool that makes it all so easy to use. Brand spanking new in Sonicfire Pro 4 is the feature deemed 'Mood Mapping'. 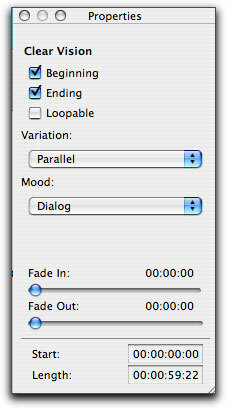 It is this new Mood Mapping feature that transcends simply adjusting the cut by length. Once again, be reminded that I have used SmartSound and Sonic Fire Pro for quite some time. Hearing the same music track on someone else's video that I had used in my own film the previous year for this festival or that has often perturbed me. Sonicfire Pro 4 has now, for the most part, done away with that from occurring again. With the new Sonicfire Pro 4 application comes a new collection of Mult-layered music they have entitled 'The Strata Series'. What makes the Strata Series of music unique is that each of the instruments in every music composition has its own layer on the track. Thus, if a particular cut contains guitar, oboe, drums, harp and piano, I may boost up, boost down or eliminate any of these instruments to create my own unique version of the melody. The Mood Mapping is essentially different versions of each piece, which you can customize to your hearts content. There are different versions of each piece to fit your particular video. There is the full version of the piece with complete instrumentation as well as versions labeled 'small group, heavy, light, Lead only, sparse, acoustic trio and more. The dialogue version brings down the instruments and eliminates others so as to be placed behind; you guessed it, a narrator speaking. Each version of the Mood Mapping feature uses somewhat different instrumentation as to be expected and can be further customized to fit your ear and your video. The Properties windows enable you to quickly and easily make creative adjustments to your compositions. Transitioning each version from one to the other is a simple matter of matter of marking and blading the original piece and clicking on the "Add Mood" button and making your choice. You can easily adjust the length of each transition as one mood dissolves into another. 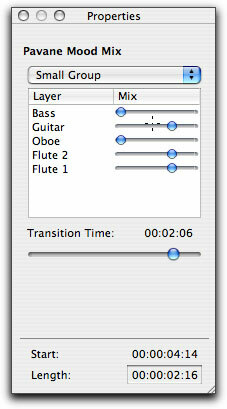 To the left of the timeline, each instrument playing within your chosen piece is listed. Open up the key frames icon and you can adjust the volume of any particular instrument or mute the instrument entirely thereby creating a wholly different version. You may also lock any particular layer of music, add multiple layers for Foley and dialogue and make all the subtle and enhancing adjustments you feel you need. With the Video preview window just below it, it is a real advantage to be able to key frame your music as you watch before exporting. It is a real boost in your time flow efficacy. Keyframing your composition to the measure with imported video. All previous SmartSound discs can be used in Sonicfire Pro 4 just as easily as they were used in previous versions. While those discs will not be able to take advantage of the Mood Mapping feature, with the multiple timeline interfaces, you can layer music and sound effects, which was not possible in Sonicfire Pro 3 or earlier versions. Thus, there really is a good reason to upgrade to Sonicfire Pro 4. In addition, earlier collections of SmartSound music were offered in both 22k and 44k versions, with the 44k version needing a special unlocking code. The new Strata Series of music are all 48k DV quality multi layered discs. There are currently 10 collections of the multi layered Strata series for you to chose from and many more on the way. The bottom line is that Sonicfire Pro 4 really does offer an unprecedented control over the feel, mix and creative input with purchased copyright free music. 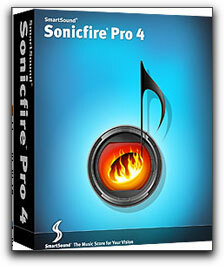 Sonicfire Pro 4 is one of the more user friendly applications I have ever had the pleasure to use. Learning it is a snap. Never again will I expect to hear the same version of any piece I use in another's film. I'm smiling!! !